Since 1967, the Consumer Electronics Show (CES) has been a showcase for our high-tech future. Language translators, virtual reality systems, and even robots have graced the many different convention halls that have hosted CES over the years. Below we have a look at some of the fabulous gadgets from the Consumer Electronics Shows of yesteryear. But don’t be confused if you see the Windy City mentioned in the captions below. The show is held in Las Vegas today, but there used to be a “summer CES” in Chicago until the mid-90s. 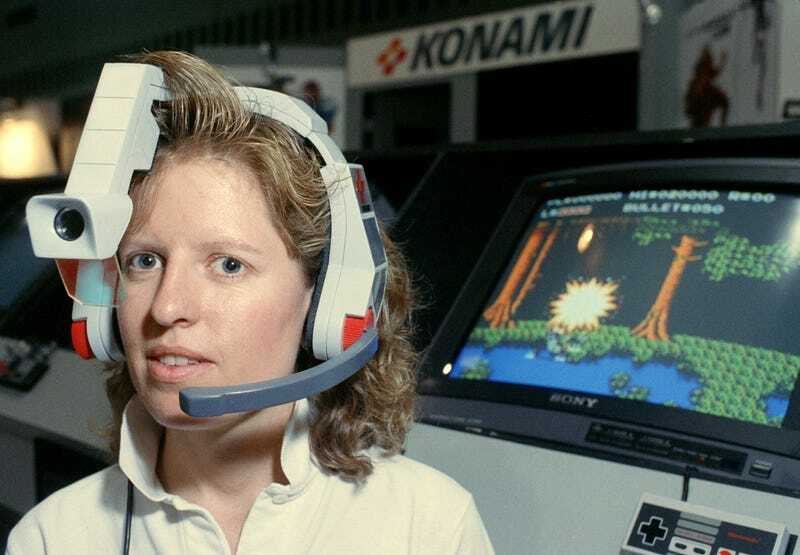 Above: Susan Bach at CES Chicago in 1990, demonstrating the Konami LaserScope headset, designed for use with Nintendo games. CES as the doors to the show opened on January 9, 1997. (Left) A B.O.B. robot (which stands for Brains on Board) is on display at the Consumer Electronics Show in Chicago on Monday, June 6, 1983. The personal robot assistant was the great promise of our 1980s future. (Right) A woman demonstrates Atari’s new game, Mind Link, on June 5, 1984 at the CES in Chicago. The device was supposed to pick up brain waves which would translate to movement on the screen. The accessory was never released. Franklin Computers’ “Holy Bible computer” at the Consumer Electronics Show in Chicago on June 2, 1989. The device was available in both the King James version and the New Revised Standard version. A+H International’s “Beeper Kid,” a child locator device at Chicago’s Consumer Electronics Show on May 28, 1992. When the kid got more than 35 feet away, the parent’s beeper was supposed to go off. Virtual Vision Sport virtual reality eyeglasses at the Consumer Electronics Show in Chicago on June 4, 1993. Why is this gentleman from Motorola holding a cheeseburger next to a cellphone at the 1994 Summer CES in Chicago? Because it was considered a big deal that the phone weighed 3.9 ounces — or less than that cheeseburger. REALWare’s “virtual reality” system called Virtual Hoops being demonstrated during the Consumer Electronics Show on January 4, 1996, in Las Vegas. Robert Minkhorst, president and CEO of Philips Consumer Electronics Company, holds a DVD at the Consumer Electronics Show in Las Vegas on January 5, 1996. DVDs were touted as the most futuristic way to watch movies — able to store over 14 times as much data as a CD. Two women from ITT Night Vision demonstrate Night Quest night vision devices during the Consumer Electronics Show on January 7, 1996. Seiko’s Quicktionary, a pocket-sized “scan-and-see” translator, on display in oversized form during the International Consumer Electronics Show, on January 9, 1998, in Las Vegas. The hand-held scanner could translate and display about 400,000 words. Judy Baker, Product Manager for Plantronics, shows off the CT10 headset telephone, a small cordless phone at the opening of the Consumer Electronics Show on January 6, 2000 in Las Vegas. The Samsung SPH-S100 watch phone is shown at CES in Las Vegas on January 7, 2001. The watch combines a cell phone and wristwatch in one. Bill Gates, then chairman of Microsoft, shows off a Smart Personal Object Technology (SPOT) wristwatch by Fossil on January 8, 2003 at CES. The Phillips Key019 Wearable Digital Camera, on display at CES in Las Vegas on January 7, 2004. Audio players and phones from dozens of different manufacturers on display at the Consumer Electronics Show in Vegas on January 6, 2005.